1V. Lashkaryov Institute for Semiconductor Physics NAS of Ukraine, Kiev, Ukraine; 2Caspian State University, Aktau, Kazakhtan. 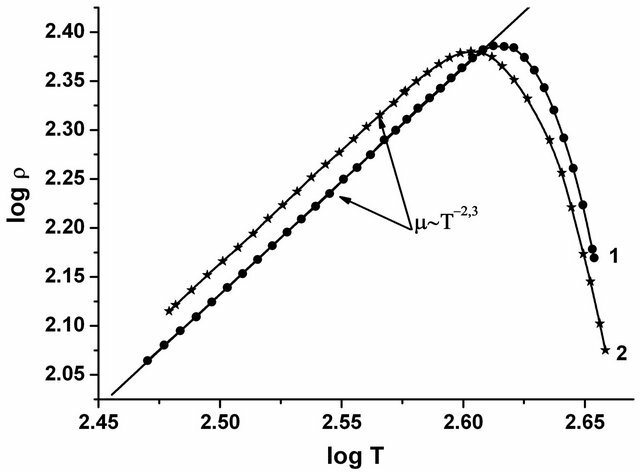 The change in electron mobility of n-Si with increasing the temperature which may be due to the inclusion of gLOphonon energy of 720 K, is presented. Under orientation of the uniaxial pressure X////J, g-transitions are attached in the directions  and . The f-transitions are not completely removed from valleys located in the plane (100). In this case, there is no change in the slope of the dependence logρ vs. logT for the temperature range 77 to 450 K. So, no appreciable contribution of g-transitions to intervalley scattering occurs, while the observed is the decisive role of ftransitions to intervalley scattering. The results of measuring of the tensoresistivity effect for n-Si crystals under X////J are presented at these temperatures too. Previously , the crucial role of f-transitions in intervalley scattering of electrons in n-Si with strong uniaxial pressures X// and temperatures to 300 K was first demonstrated. In the same work, small contribution of g-transitions to this type of scattering was shown. It is unknown, however, whether the electron mobility wile change at T > 300 K, if there is the possibility of g-transitions, which, moreover, are not completely eliminated under strong uniaxial pressure X//. The analysis of experimental data of many works on the study of fand g-transitions in n-Si indicates that the discussion of their role in intervalley scattering is not finished until now. This is due to the fact that silicon possesses a sufficiently wide set of phonons, which can make sufficiently comparable contribution of electrons to the intervalley scattering [2-7]. The scattering between Δ1 valleys that are aligned along the non-equivalent directions is caused by f-transitions. In these processes the phonons from Σ line are involved. 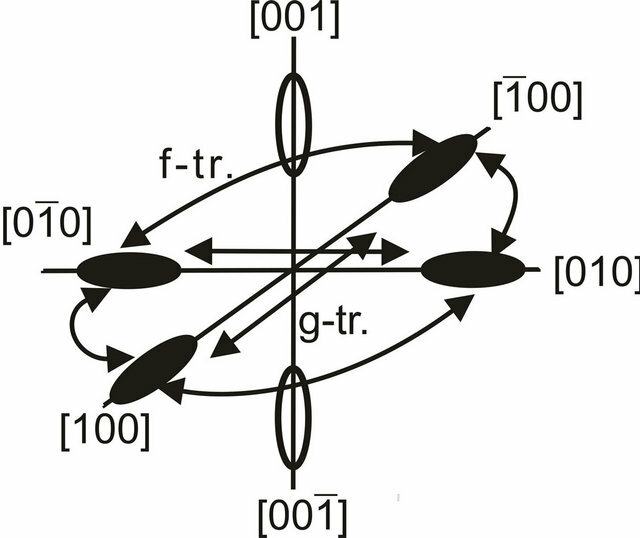 According to the selection rules the TOand LOphonons with Σ1 symmetry are involved. Electron-phonon scattering between the valleys that are aligned along Δ is named g-transitions. This scattering is caused by the transitions in which the phonons are involved. In silicon these are the LO-phonons of symmetry. In  was determined that electron interaction with g-type phonons is approximately in one and a half lower and the interaction with the f-type phonons is nearly twice as powerful as previously reported . Howeverfor he equilibrium condition low-energetic transition with assistance of g-phonons are forbidden. The change in mobility with increasing temperature may be due to inclusion of intervalley scattering related with g-transitions. Their contribution can increase with increasing temperature as a result of gLO-phonon energy of 720 K, deformation potential constant of which is »7.5 × 108 eV/cm. We used the direction of uniaxial pressure X////J to change at T > 300 K g-value and f-transitions in intervalley scattering. In this orientation of the uniaxial pressure, g-transitions are attached in the directions  and . Furthermore, with strong intervalley scattering in uniaxial pressures, f-transitions between valleys  and  and [ī00]; [00ī] and  and [ī00];  and [0ī0] and ; and [00ī] and [0ī0] and  (Figure 1) are excluded, and thus their intensity as compared to that in unstrained crystals decreases. This type of experiment gives us confidence that if there is significant contribution of gLO-conversion to the intervalley scattering of electrons in silicon at T = 77 ¸ 450 K.
As known, “Intel Corporation” introduced n-MOS transistors with silicon uniaxial deformed in the direction  channels, thus increase the mobility of electrons around twice at T = 300 K [8,9]. This increase is due to removal of intervalley scattering related with f-transitions, thereby increasing the steepness of the currentvoltage characteristics (CVC) and cutoff frequency of switching. Figure 1. Scattering of electrons in n-Si for X// X = 1.2 GPa. trons in n-Si at T = 77 ¸ 450 K the specimens had sufficiently low donor concentration and namely 4 × 1013 cm−3. Sample dimensions were (0.7 × 0.7 × 10) mm3 for longitudinal investigation geometry. In all the cases the quantity E don’t over the limit of 0.5 V/cm. The accuracy of the X-ray method for determining the crystallographic orientation was ±15². After mounting a sample on the experimental setup the precision of its orientation with respect to the applied stress was not less than ±30². We used the installation for transport phenomena investigation under high uniaxial pressure described previously . In this work we used the tensoresistivity (TR) effect at different directions of uniaxial pressure and temperature dependence of resistivity r = r(Т) in uniaxial deformed and undistorted crystal n-Si for the temperature range T = 77 ¸ 450 K. This temperature range covers the region of intrinsic conductivity of silicon crystals, so all conclusions about the impact of fand g-transitions are limited to the temperature at which the intrinsic conductivity sets in. Figure 2. 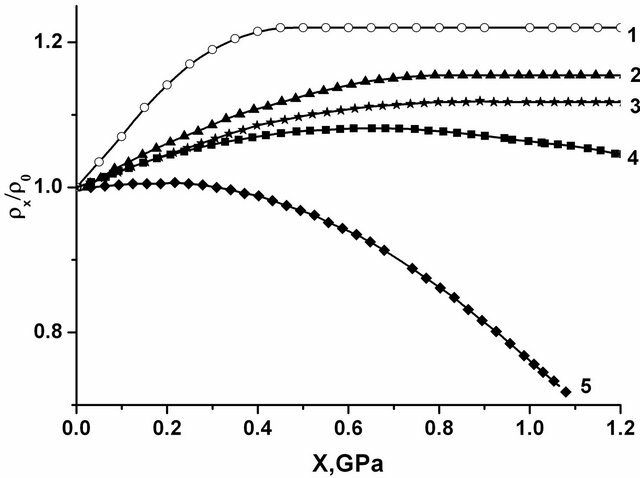 Dependence of in n-Si (nе = 4 × 1013 сm−3) for X////J at different temperatures: 1 - 77; 2 - 300; 3 - 320; 4 - 350; 5 - 400; 6 - 450 K.
Figure 3. The dependence of ρ = ρ(Т) in double logarithmic scale in n-Si (nе = 4 × 1013 cm−3) for X////J: 1 - X = 0; 2 - X = 1.2 GPa. f-transitions are completely eliminated the slope of the lg μ - lg T dependence changes from −2.3 to −1.6. For greater confidence in the decisive contribution of ftransition in intervalley scattering, we used the uniaxial pressure direction X//, in which the g-transitions in the directions  and  are added. Also, f-transitions are not completely removed, and f-transitions between valleys located in the plane (100) remain (Figure 1). Figure 4 represents the results of measurements of the TR effect for n-Si crystals under Х////J at different temperatures T, K.
Figure 4. 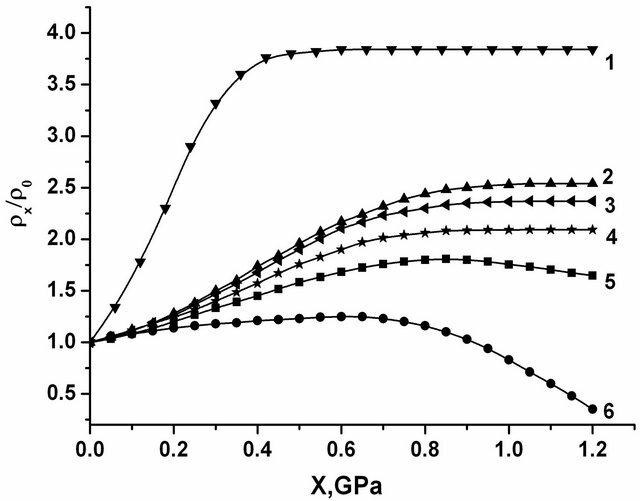 Dependence of in n-Si (nе = 4 × 1013 cm−3) for X////J at temperatures: 1 - 77; 2 - 300; 3 - 350; 4 - 400; 5 - 450 K.
Figure 5. Dependence of ρ = ρ(Т) in double logarithmic scale for n-Si (nе = 4 × 1013 cm−3) for X////J: 1 − X = 0; 2 − X = 1.2 GPa. 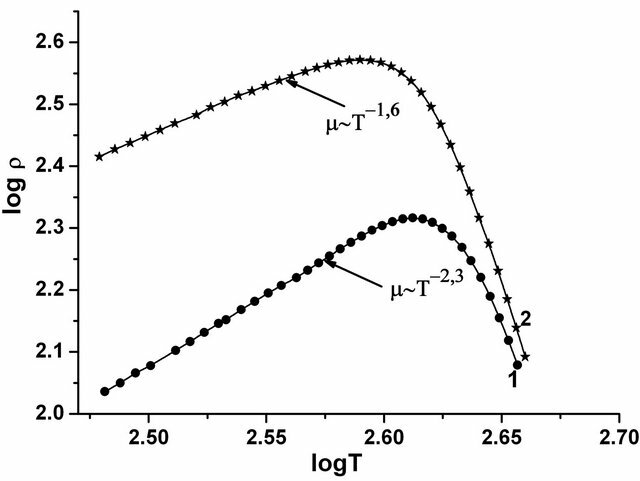 range T = 77 ¸ 450 K.
The tensoresistivity effect in Si is experimentally studied at the temperatures T = 77 ¸ 450 K. It is shown that at X// when the f-transitions are completely eliminated the slope of the lg μ - lg T dependence changes from −2.3 to −1.6. A significant change in the slope depending on m vs. T in the pass from unstrained silicon μ ~ Т−2,3 to uniaxial strained crystals μ ~ Т−1,6 for X// indicate a decisive contribution of f-transitions to intervalley scattering. In the case X// at strong uniaxial strain 4 ftransitions and 2 g-transitions remain. The uniaxial stress does not change the slope of the lg μ - lg T dependence that points to the dominant contribution of f-transitions to the intervalley scattering. We have established that the absence of changes in the slope of this relationship in the X// indicates the absence of substantial contribution of g-transitions in intervalley scattering of electrons in this temperature range and the presence of decisive contribution of f-transitions to the intervalley scattering. Moreover for the equilibrium condition low-energetic transition with assistance of g-phonons are forbidden. The uniaxial deformation can be also used to increase the mobility of electrons in the devices operated at T > 300 K.
In the temperature range T = 77 ¸ 450 K at high temperature band for the temperature dependencies logr − logT the silicon intrinsic conductivity begins. Therefore, to determine the slope of logr − logT dependence, we use there a comparatively narrow temperature range. P. I. Baranskii, I. V. Dakhovskii, V. V. Kolomoets, et al., “Intervalley Scattering in n-Si for Temperature Range 78 - 300 K,” Semiconductors, Vol. 10, No. 8, 1976, pp. 1480 -1482.